How To Rock The Rose Gold Trend! I have loved the rose gold trend ever since it started and I know this post is a little late in regards to the trend, I thought I would tell you my top ways of getting a bit of rose gold into your life! Eyes – Rose gold is such a stunning colour to pop on the eyelids for both a day or night time look. 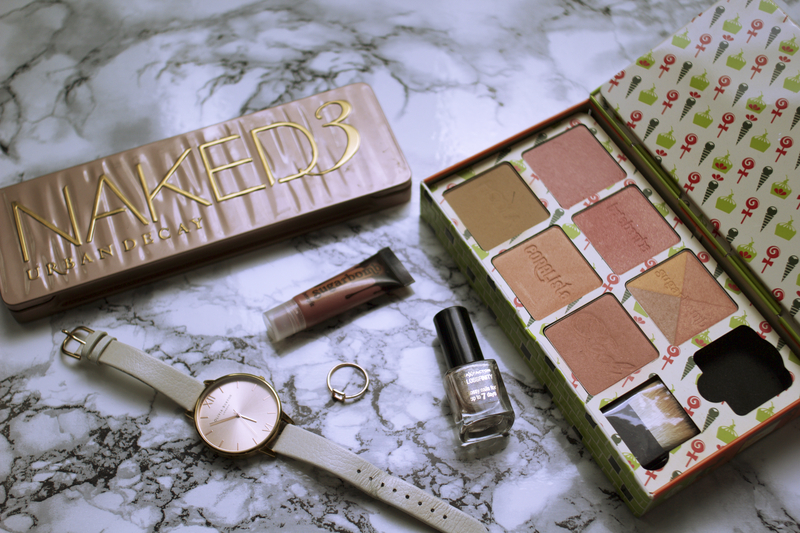 The Urban Decay Naked 3 Palette is my absolute favourite and the packaging and the colours inside are beautiful! I have done a couple of looks with this palette so I’ll link those here and here. Lips – Benefit Sugabomb Lipgloss is a lovely rose gold toned gloss, they aren’t very sticky and are easy to apply giving a subtle wash of colour. Nails – Max Factor Glossfinity in 55 Angel Nails is kind of cross between a champagne and a rose gold but it is the closest I have in my collection. It really is a pretty glittery colour and featured in my Spring/Summer Nail Edit as one of my top ten for this season! Accessories – I love rose gold accessories perhaps even more than I love rose gold makeup. My faves are my Olivia Burton Watch and my gorgeous Whistles Ring. The watch was featured in last weeks OOTW and both items were in my What’s On My Hands post. I hope you love these two as much as I do as they are some of my favourite pieces! A short and sweet post today as I have been at work all day but I hope you like my rose gold feature. It is honestly one of my favourite trends and I am in love with all the choices mentioned above. Let me know your favourite rose gold makeup and jewellery items, I am always looking for more! 5 Places I am Dying to Visit! Great post! I am the same, I love anything that is rose gold! Love the Naked 3 palette, such pretty shades! I really need to try some of the Benefit powder blushes, they all look so nice! No bother 🙂 I’ll need to try them out! Oooh, I am a total sucker for rose gold! I have the Makeup Revolution Iconic 3 Palette, which is a decent dupe of Naked 3 and I adore it, it’s surprisingly versatile. Your Olivia Burton watch is gorgeous too.